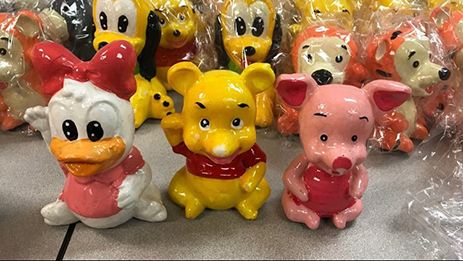 Federal agents intercepted $2 million worth of crystallized methamphetamine that had been transported from Mexico inside wax figurines of Disney characters like Pluto, Donald Duck, and Winnie the Pooh. The 500-pound narcotics haul was seized by Drug Enforcement Administration agents working in Atlanta. Each of the figurines contained about a pound of crystallized meth that apparently was manufactured in Mexico. The knockoff wax figurines, seen in the above and below DEA photos, were shipped along with hundreds of legitimate ceramic Disney figurines, investigators say.